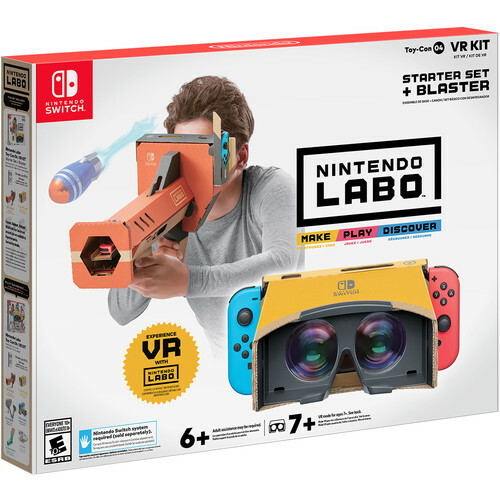 With the Nintendo Labo Toy-Con 04 VR Kit Starter Set + Blaster, you'll be able to combine the technology of the Nintendo Switch with the fun of DIY creations. Start with a piece of cardboard and build yourself one of two different Toy-Con projects. You can build VR goggles and a blaster. It even comes included with a programming tool called VR Plaza so you can create your own VR games and experiences. Build Toy-Con creations with step-by-step instructions. Add your Nintendo Switch console and have fun with the included software. Explore how the mechanics work as you build and play with your Toy-Con creation.